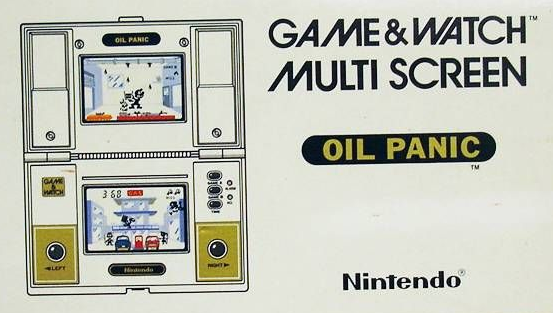 Oil Panic is one of the better known games from Nintendo’s Game & Watch range. This one is played across two screens and was actually the first double screened Game & Watch, making it quite significant from a historical perspective. Like all Game & Watch games, you complete a simple task over and over again (as it becomes increasingly difficult) in order to try and get the highest possible score. In this one you play as a person (probably Mr. Game & Watch) who holds a couple of buckets which they use to catch falling drops of oil; there are several small flames on the ground and if a drop hits the ground, the fire will engulf you. Once you’ve caught the oil, you have to toss it out of the building, either through the left side of the room or the right side. The oil you toss out then goes down onto the bottom screen, where a man is hurrying back and forth with a big oil drum. You have to toss the oil out at just the right time for the oil drum man to catch it – if you miss, it will land on innocent people standing near gas pumps. While I can describe the game play, it’s hard for me to fully understand what’s going on. Why do you appear to be on the second floor of a petrol station? Where is the oil coming from? Why do there appear to be customers at a petrol station which is on fire? It’s all a bit of a weird situation. That’s not to mention that it quickly becomes very hard too; the person with the oil drum seems to move very quickly and oil drops are falling all around. It really takes a while to get into the swing of Oil Panic. I think it’s the kind of thing which will probably mainly only appeal to big Nintendo fans, like me.